We deliver high-quality results on every roof installation job we take on throughout Midland. The process of roof installation is very precise and requires a certain level of skill and experience. If an inexperienced person climbs up on the roof to install the materials, a number of things could go wrong. Without proper training in safety practices, a roofer could fall off and become seriously injured. Without following the proper steps for roof installation, you could end up with a roof that leaks or shingles that fall down in the first windstorm. Instead of taking a chance with something as serious as the roof on your home or office building, call us at Slippery Slope Roofing. We deliver high-quality results on every roof installation job we take on throughout Midland, Ontario. 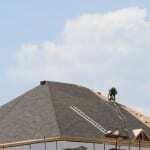 Unlike some other local roofing companies, we don’t take on too much work at once. Instead, we focus on a single client until that job is done before we move on to the next roof. This practice allows us to provide better results for each of our customers, giving you the time and attention you deserve. We also provide excellent pricing and some of the best shingles in the industry. We train our roofers to install the shingles properly to maintain the warranty provided by the manufacturer. With over five decades of experience in the roofing industry between our owner and foreman, you can feel confident that your structure is in good hands when you trust us at Slippery Slope Roofing for your roof installation project. We offer installation services to both commercial and residential clients, along with repair, maintenance, and replacement services.